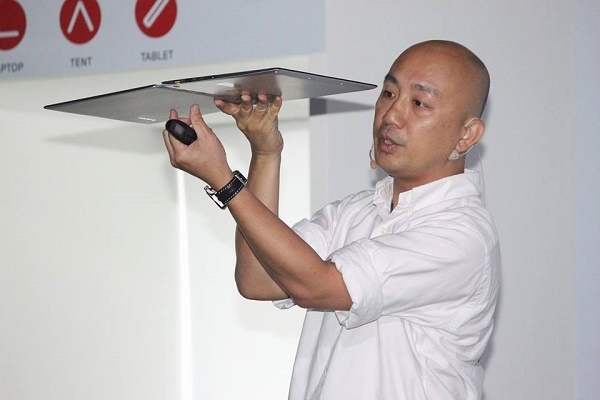 Lenovo (HKSE: 992) (ADR: LNVGY) announced a new device duo that gives users a new way to use convertible PCs – the YOGA 3 Pro and YOGA Tablet 2. The new 13-inch YOGA 3 Pro is dramatically thinner and lighter than its predecessors with a new striking and sturdy watchband hinge. It uniquely addresses users’ desires for an extremely stylish device, best-in-breed performance capabilities and the hardware and software adaptability they crave. For a new and better way to read, watch, connect and create, the YOGA Tablet 2 Pro redefines the tablet experience with a built-in tablet-projector. The 13-inch entertainment tablet that gives out an exhilarating 8 watts of sound including a subwoofer – a first for a tablet. “Many consumers loved the YOGA design and its unique features – for both PC and tablet. To continue evolving the YOGA range as a truly adaptable, intelligent device was a natural step. We wanted to give users a more compact machine with innovative features that will truly adapt to the user giving them the best experiences ever,” said Khoo Hung Chuan, Country General Manager, Lenovo Malaysia. While the YOGA 2 Pro became synonymous with thin and light, the new YOGA 3 Pro takes this concept even further by shaving 17 percent from its predecessor’s frame at just 12.8mm thin – thinner than a pencil when opened. The PC also comes in lighter at 1.19kg – 14 percent less than before – lighter than a bottle of water. The device achieves this incredibly thin and light design thanks to Lenovo’s new watchband hinge constructed from more than 800 pieces of steel and aluminium. Lenovo engineers redesigned the original YOGA hinge to ensure that it provides the same degree of flexibility and flatness seen in metallic watch bands. Instead of two focus points, there are now six. Besides that, the YOGA 3 Pro also offers users an excellent experience in any mode from the moment they open the lid. With a QHD+ 3200×1800 display, this bright and clear screen looks amazing whatever the task – editing images in Laptop mode, video chatting in Stand mode, watching movies in Tent mode or online shopping in Tablet mode. Built with durable Gorilla Glass, this screen is designed to hold up to wherever users go. While videos look stunning, the YOGA 3 Pro makes them sound just as spectacular with premium JBL® speakers with Waves® Audio, which automatically adjusts the audio in each of the four modes so that the audio still sounds crisp and clear even, when the speakers are not facing the user. Equipped with an Intel® Core M™ processor, solid state drive storage up to 512 GB SSD and Intel integrated graphics, users can multitask at will, store large digital libraries and experience smooth video playback without lag. The YOGA 3 Pro keeps users connected via high-speed 802.11 a/c WiFi and also allows them to run longer with up to seven hours of battery life. To advance the concept of adaptive computing and complement the YOGA’s responsive hardware features, Lenovo also created the latest Harmony software experience. Harmony gives YOGA owners a new way to discover applications and customize how they behave when used. For example, when reading an e-book, Harmony will automatically change the brightness and color temperature according to the environment lighting. When using any presentation software, Harmony can enable motion control or touch depending on the mode, or when watching videos it can optimize the audio settings. Harmony recognizes and optimizes the experience with over 50 of the most popular applications. Harmony also recommends which apps other YOGA owners find useful and provides a handy shortcut to the apps used most frequently in each mode. Developed with Ashton Kutcher, who joined Lenovo as a product engineer a year ago, the new YOGA Tablet 2 Pro is designed to elevate media experience with its star feature a built-in Pico projector. The projector lets users turn inside walls into an instant TV or movie screen. With automatic image adjustment and up to three hours playback time, users can get through a double feature before having to plug in the tablet. The tablet’s enhanced audio system also provides a captivating 8 watts of sound, quadrupling the speaker power of an average tablet. Its dual, large-chamber speakers are front-facing for dynamic audio, and a subwoofer on the back rounds it out with deep bass notes while Dolby® Audio and Wolfson® Master HiFi™ ensure a multi-channel listening experience, just like the movies. It also features a QHD 2560×1440 screen for life-like images, designed specifically for digitally-hungry consumers. In conjunction with the YOGA launch, Lenovo Malaysia is partnering with Urbanscapes 2014 to engage with local talents of Malaysia. As part of the collaboration, there will be an online contest for consumers titled ‘Technology Inspires Creativity’ where fans will submit their most creative artwork device skin and a slogan. Entries will be judged by an esteemed panel of judges – from DJ Eva T, a well-known “Electronic Dance Music Queen“ in South East Asia; Dennis Yin, a dancer from award-winning dance crew, Elecoldxhot; to Vernon Chan, a prominent tech blogger; and Yuyu Zulaikha, a local fashion influencer. The top three winners chosen by the judges will walk away with the latest YOGA devices, prize money and tickets to the 2014 Urbanscapes event happing at Horse Ranch, Resorts World Genting, on 6th December 2014. For the latest Lenovo news, subscribe to Lenovo RSS feeds or follow Lenovo on Facebook and Twitter.